Learn how to make your own DIY reverse canvas art with this free tutorial (written instructions and video!). 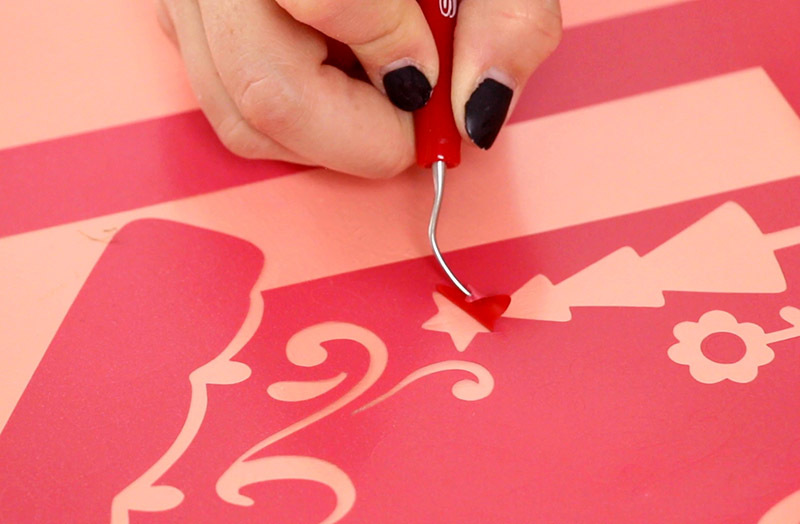 You can completely customize your DIY reverse canvas art to fit any decor or occasion with your Silhouette or Cricut. This post contains affiliate links, which help to support this site at no extra cost to you. Thanks! 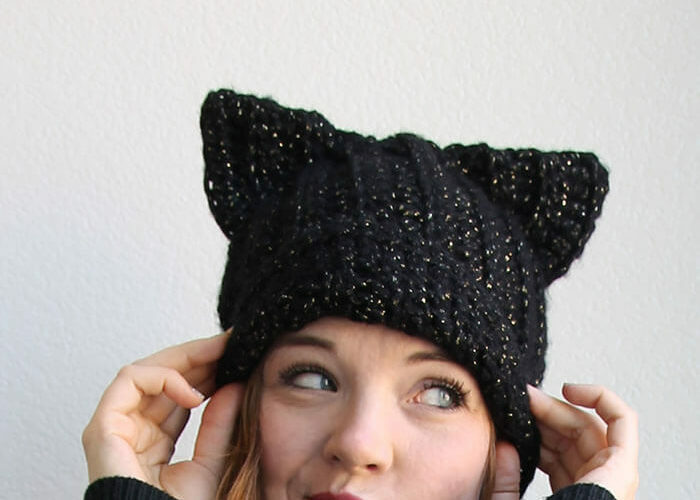 I am really excited to share this fun project with you all today! Today we are making reverse canvas art! Have you heard of the reverse canvas technique? It’s a simple craft/DIY project that I am seeing more and more of, especially in Silhouette and Cricut crafting communities. I have done a few reverse canvas projects, so I figured it was time to do a blog post all about them. 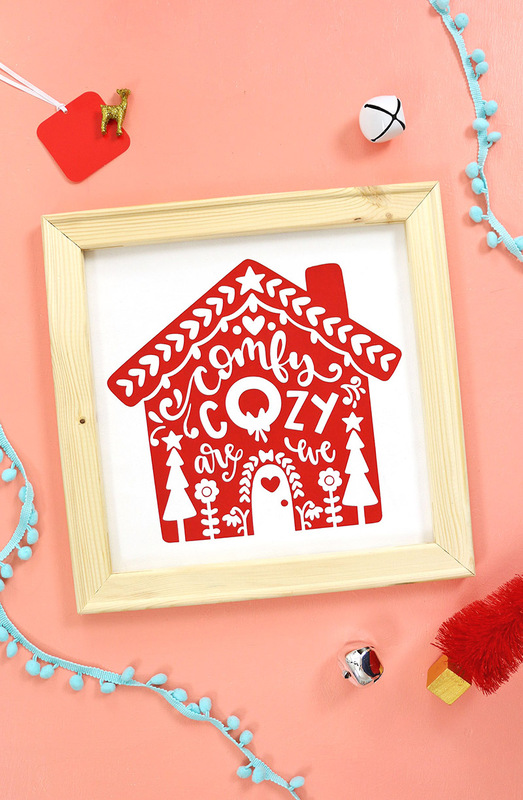 Since we are going into the holiday season, we are going to be using one of my latest cut file design (which is part of the new and completely adorable Cozy Christmas cut file bundle) to make a super cute Christmas reverse canvas art project. 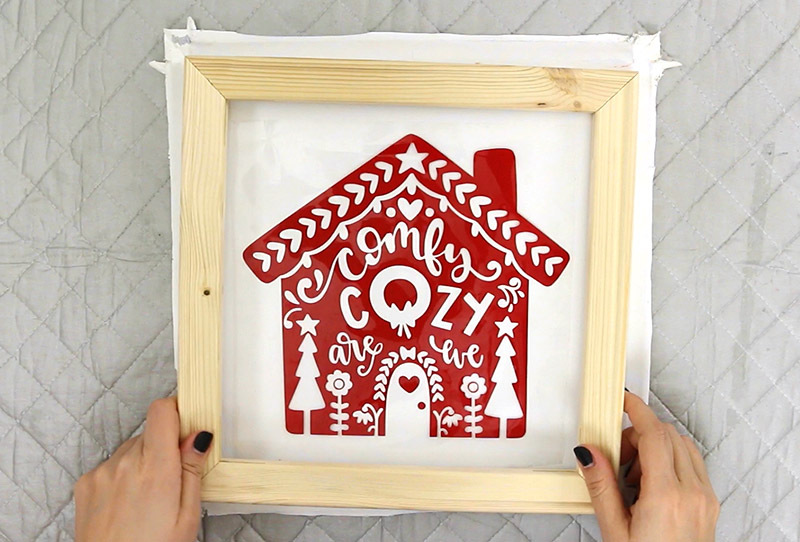 Of course, you can use this technique with any cut file design to make a cute piece of art for any holiday or home decor style. So, what is this reverse canvas thing I’m talking about anyway?? 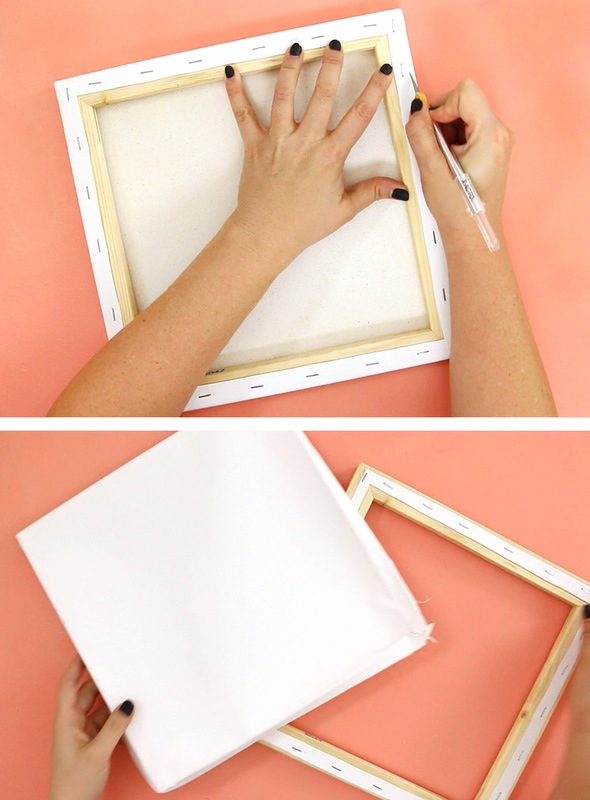 A reverse canvas is a simple project that uses a simple blank stretched canvas to create a beautiful, framed art piece. First, you will need to collect your supplies. You only really need a few items for a basic reverse canvas. To add a heat transfer vinyl design, you will need a few more things, but it is a super simple way to get a great looking design. If you have never worked with heat transfer vinyl before, then I recommend checking out my beginner’s guide to iron on vinyl right HERE. 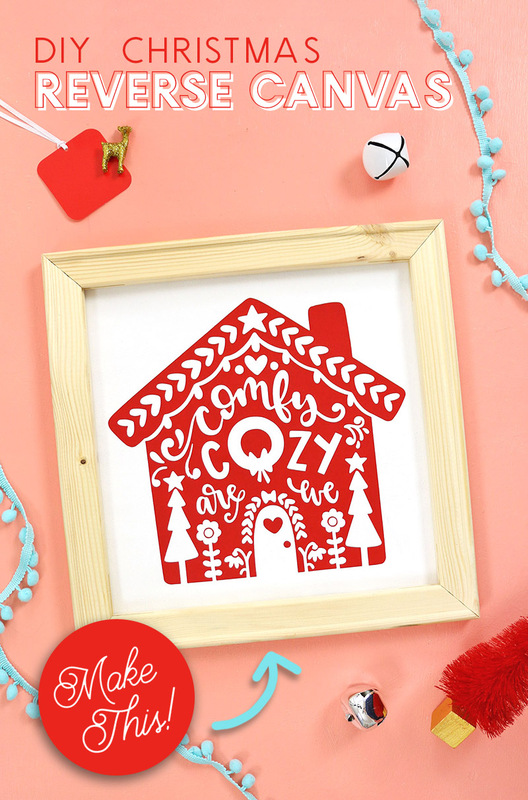 My Comfy Cozy House design is part of the adorable Fresh Cut Cozy Christmas SVG Bundle. This collection of cut files is specially designed to help you create all kinds of amazing Christmas crafts this season. It contains over 60 elements and is on sale for only $5.97 with Early Bird pricing! Once you have your supplies collected, it’s time to get making! 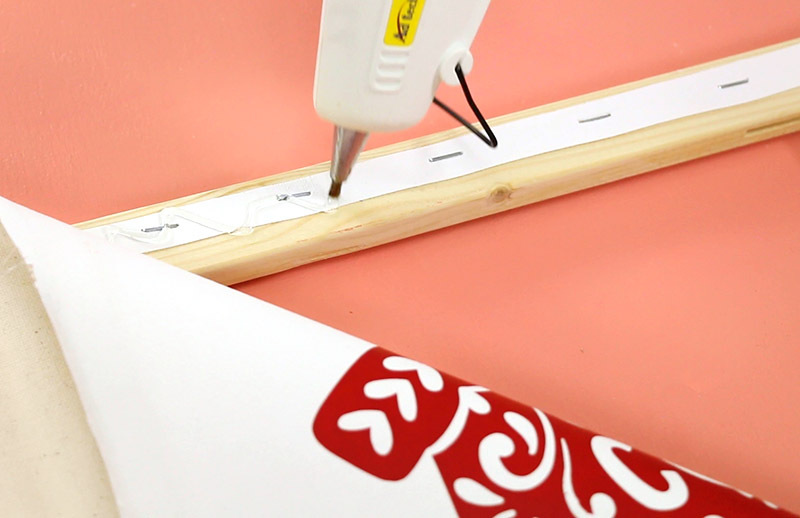 Flip your canvas over and use your craft knife to cut through the canvas around the edge of the frame on the outside of the staples. I have found the corners to be the most difficult because you need to go through multiple layers of canvas. Just take your time and be careful as you cut through the layers. When you have cut through the canvas all the way around the frame, pull the canvas off. 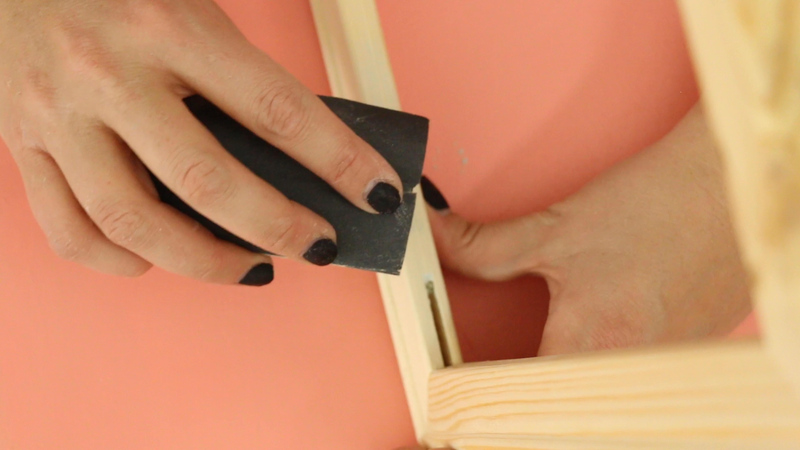 You do not need to take the staples off the back of the frame as they won’t show in the finished project. I have found that a lot of the frames have a number stamped on them. If you are painting or staining your frame then that stamp won’t be a problem, but if you want to leave your frame natural wood, you can use sand paper to remove the stamp, which is what I did for this piece. Part of what makes a reverse canvas so great and so easy is heat transfer vinyl! I love working with all kinds of vinyl, but I especially love iron on vinyl. If you need a refresher on (or an introduction to) working with heat transfer vinyl, check out my beginner’s guide here. First, start off by scaling your design to fit in the space inside of your frame. Then cut the design from your heat transfer vinyl. After it has cut, you will need to use your weeding hook to remove the excess vinyl from around your design. Next, position your design on the canvas using the frame to guide your placement. Then, apply the design using your iron, Easy Press, or heat press. Finally, remove the clear plastic carrier sheet from your design. Now it’s time to glue the canvas back onto the frame! Place the frame on top of the design, positioning your design in the center of the frame. Then, apply hot glue to each side one at a time, pulling to keep the canvas taut. 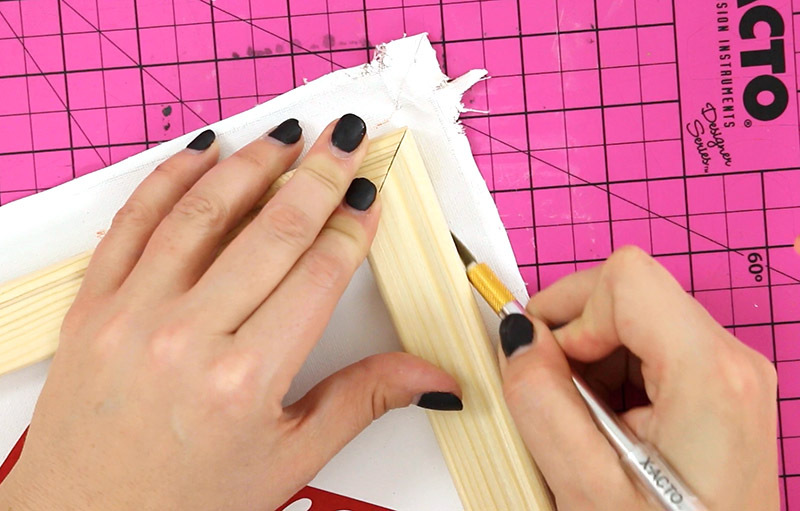 The final step in making our DIY reverse canvas art is to trim off the excess canvas. To do this, simply place your piece face up on top of a cutting mat and use your craft knife to trim the extra canvas off along the edge. And that’s it! Your DIY reverse canvas art is all done at this point! I am so happy with the way this cute Christmas art turned out, and I just love this technique. What do you think? Have you made a reverse canvas yet? Will you give this technique a try? Awww you are so sweet! Thanks so much, friend! Great tutorial! One quick question, what tempurature do you use for the hot glue?